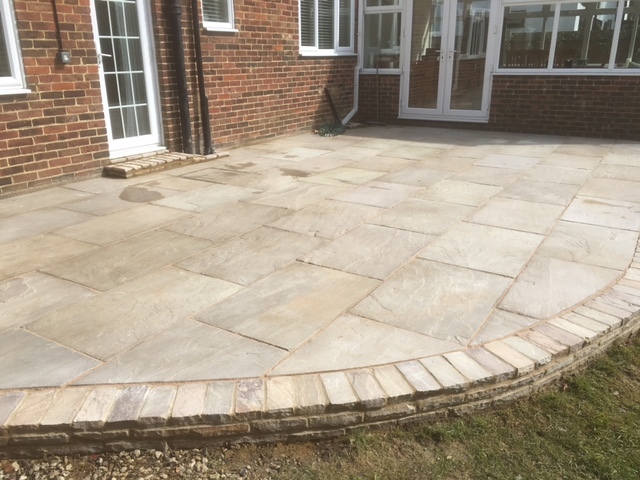 During our 20 years of operation Benchmark has established itself as one of the leading patio contractors in Maidstone. We offer a professional and affordable patio design and construction service that can be tailored to suit any budget and any project large or small. We are committed to creating the perfect outdoor space for you and your family to safely enjoy for many years to come,and you can do so in the knowledge that significant value has been added to your home. We start by visiting you at home and discussing your particular needs and requirements,any patio ideas of your own and how you intend to use the patio in the future and the whole garden space generally. The available budget is of course important and we will ensure that all proposals and plans do not exceed it. We will gladly answer any questions you have about the design and patio construction process , offer advice and suggestions and deal with the cost implications of using different building materials and any other issues that arise. Once we have reached a consensus and have a clear understanding of your requirements we will conduct a site assessment, take relevant measurements and photographs of your garden to incorporate into the design software. Based on this information over the following few days we will produce a costed estimate* of our patio construction proposal and a 3D plan using specialist garden garden design software to help you visualise the completed project. *Estimates are based on all work being carried out by Benchmark Construction & Landscaping Services. As we are not dependent on outside contractors and third parties we are able to accurately estimate all labour costs and pass on significant savings to our customers. As a result we are able to offer the most competitive patio construction and installation prices in Maidstone. Whether you have your own patio ideas and just need a building contractor,or would like our patio designs and installation service,Benchmark Construction and Landscaping can meet your requirements. 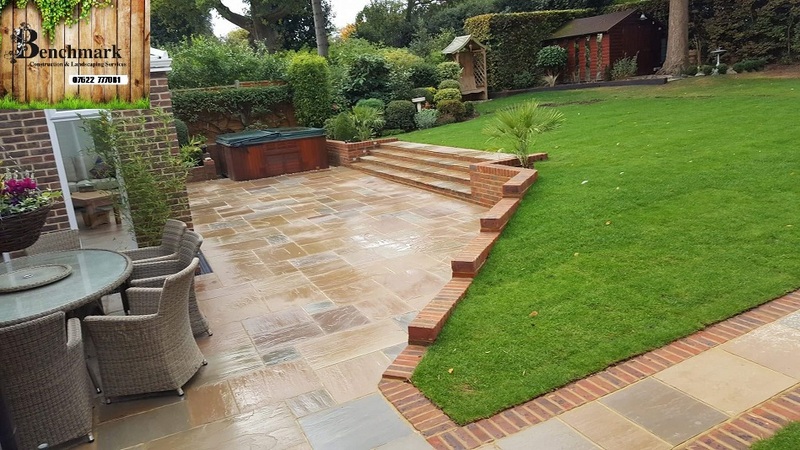 With over two decades of experience in delivering quality landscaping services and garden construction you can be assured of the most professional work carried out to the highest standards – and at a price you can afford. We believe we are the best value for money driveway and patio builders working in Maidstone , across Kent and throughout the south east. Delivering quality at a reasonable price is at the heart of what we do. Patio installation & design by Maidstone’s leading patio installers. From the initial consultation through to design and build you can have the peace of mind that our professionalism and experience will provide you with the best possible service. A quality patio can transform your garden and provide you with years of enjoyment, as well as adding real value to your home. We work with you to understand what you need from it and how you will use it, whether it’s for entertaining, relaxing or a safe,child friendly area. We have built every type over many years in a wide variety of homes. Rest assured that whatever the size, shape or design of your garden we have the experience and ability to transform your garden into somewhere to enjoy and be proud of. We work all over Kent including Maidstone, Medway, Sittingbourne, Tonbridge, Ashford, Canterbury. When choosing our design service you can be sure that it will suit your home and environment and is sympathetic to your garden surroundings and home, and is in line with your budgetary requirements. Before selecting your material consider what qualities you are looking for. Do you want something eco-friendly? Are you looking for the most affordable option? Do you need a slip-resistant surface for safety around a pool? What look are you attracted to? Will freezing weather be a concern? Once you’ve answered these sort of questions you will be able to make an educated decision on what material is best for your patio. This will ensure that your investment will hold up for years to come. Patio paving is often the biggest expense when landscaping a yard. If you enjoy the high-end look of stone, but don’t enjoy its price tag, there are other options. You can opt for decorative concrete that mimics stone or brick. Another idea is to use a more affordable material for the majority of the work and use the stone as an accent border or design. If you plan to landscape your yard in stages, paving your patio should be the first stage. Indian sandstone – machined or natural Yorkstone Granite setts & cobbles Permeable paving – block paving Concrete slabs in a range of different textures Limestone paving slabs Travertine paving Other Services: Benchmark provide a complete range of landscape gardening services including hard and soft landscaping,construction,groundworks and drainage , decking , fencing , turf laying , artificial grass installation , commercial grounds maintenance and garden and landscape design services. The builder had left materials on site after the extension went up so our first job was to clear it out so we could get on with the job at hand. Once the site was clear our next task was to build the framework for the patio. The garden was on different levels so we had to provide retaining walls to at every level change. In this instance we used sleepers. They also formed the risers for the steps on to the patio. Sleeper planters can create a space which is easily maintained. The client wanted them to surround the patio so they could plant trees and shrubs to decorate the space. 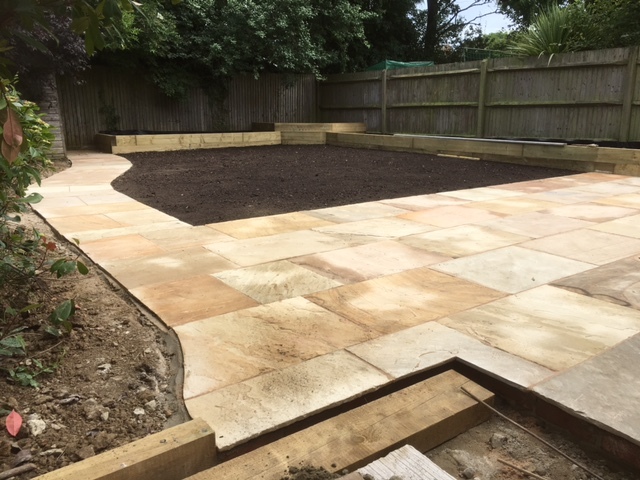 We started laying the patio using a sawn and honed sandstone which has sharp and straight edges. This type of stone is machine cut at source giving it a polished and clean look. There are all types of sandstone and they come in a variety of colours and sizes. This is a patio pack which is formed from 4 different sized slabs arranged in certain patterns. The joints should be left deep enough to allow the compound to work properly. Joints that are too shallow will not be as strong and are likely to fail later on. The compound is swept in using a soft broom and reacts with water so the use of an outside tap is essential at this stage. At this point our job was complete. The client decided they would line the planters with a membrane and fill them with their chosen soil.